Each year they arrive in droves, converging upon cities far and wide for several days of hobnobbing with some of the most creative talents around. This is MAX, the annual “creativity conference” launched in 2003 by Macromedia, the creators of Dreamweaver who wound up being acquired by Adobe only two years later. Dude, you got a Surface! The highlight of MAX is Monday morning’s general session, an event also live streamed to millions more over the internet. This year, Adobe executives debuted a renewed push toward mobile, with the Creative Profile and a new feature called Libraries tying it all together on the desktop. Microsoft CEO Satya Nadella surprised attendees with the gift of a free Surface Pro 3 with one year of Office 365. 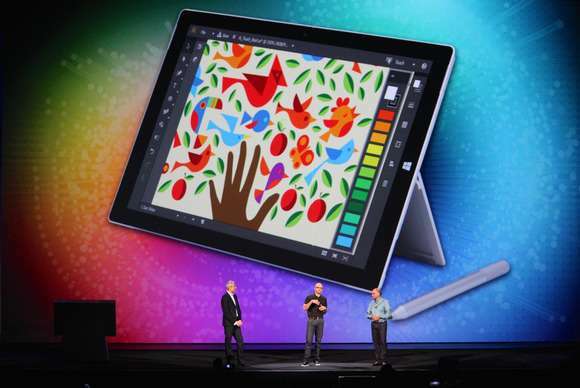 The biggest surprise came near the end of the keynote, with a special appearance by Microsoft CEO Satya Nadella, who joined Adobe CEO Shantanu Narayen on stage to show off an impressive new touch workspace for Illustrator CC and even bigger plans for the future. The keynote wrapped up by Microsoft gifting attendees (but not press) a Surface Pro 3 plus one year of Office 365, a generous move that’s likely to provide much-needed fuel for Redmond’s tablet ambitions. Tuesday morning’s general session focused less on product and more on the talent who takes advantage of those tools. Featured speakers for 2014 included photographer Ami Vitale (and adorable pandas! 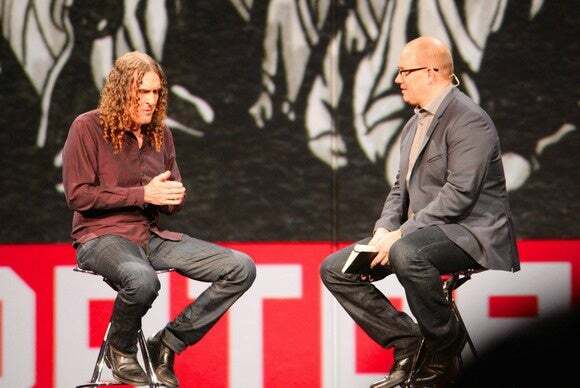 ), digital illustrator Jason Seiler, Bully documentary filmmaker Lee Hirsch, and musician “Weird Al” Yankovic, who shared his ride to the top of the Billboard charts with _Mandatory Fun_—his first No. 1 album after more than 30 years in the business. Look at Al, he's white and nerdy. Presenting each guest was Adobe Senior Vice-President and General Manager of Digital Media David Wadhwani, who noted how many of the creative talents in the audience could easily have taken the stage to share their own inspirational stories. What made these handpicked speakers unique was the refreshing honesty inherent in their personal journeys, which didn’t get watered down or turned into an Adobe marketing pitch. Among the unreleased ideas teased at Sneaks was Photoshop in a web browser, and a Defog filter to remove haze from outdoor photos. Later that evening, MAX wound down with Sneaks, an annual tradition where engineers preview unreleased ideas still brewing in the labs. Hosted by Adobe Senior Director of Customer Learning Ben Forta and actor Joseph Gordon-Levitt, more than dozen new technologies were teased, including Project Layup (a prototyping app for iPad), PSD Web Editing (Photoshop in a web browser! ), and Defog, a filter that impressively removed atmospheric haze from outdoor photos. Tuesday’s general session included an inspiring talk from photographer Ami Vitale, and plenty of baby pandas! Daily sessions are at the heart of Adobe MAX, which begin during weekend preconference labs with the likes of Photoshop specialist Russell Brown, and continue through Wednesday. I attended a handful of featured sessions this year, including “God is in the Kerning” featuring Italian typographer Matteo Bologna, and “How to Tap into Your Creative Voice and Make Work That Matters” presented by designer James Victore. 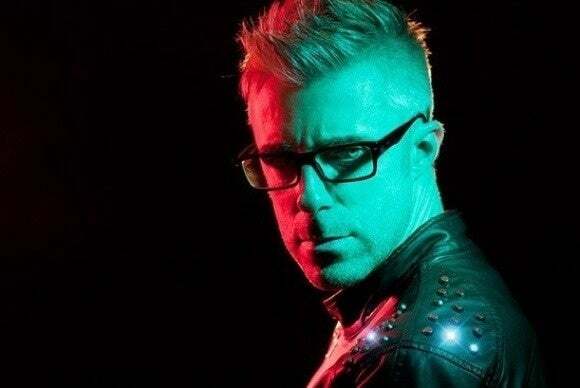 One standout was “Being a Design Renegade,” a rousing session with James White, an artist and designer whose Signalnoise Studio is based out of his small home office in Dartmouth, Nova Scotia. With a diverse roster of clients including VH1, Universal Music, and Google, White spent an hour with 350-plus attendees discussing the highs and lows of his career with refreshingly brutal honesty, including how his love of ’80s pop culture made a big impact on his work. “It was a wicked, wicked place to be and I had a great time,” White enthused in his unique vernacular during a post-conference interview. “My kind of talk relies heavily on the audience, because I stick a lot of dumb jokes in there, things to keep the energy up. I’ve done this in front of audiences where it just fell flat, but the MAX audience was into it right off the bat—they were laughing and so awesome, and that creates electricity in the room. Although MAX has refocused on creative users, the conference hasn’t forgotten its developer roots. Adobe took the opportunity to release version 1.0 of its Creative SDK, a software development kit that allows third-party applications to hook directly into a user’s Creative Cloud content as well as the Creative Cloud Market, which offers a wide variety of assets for purchase. 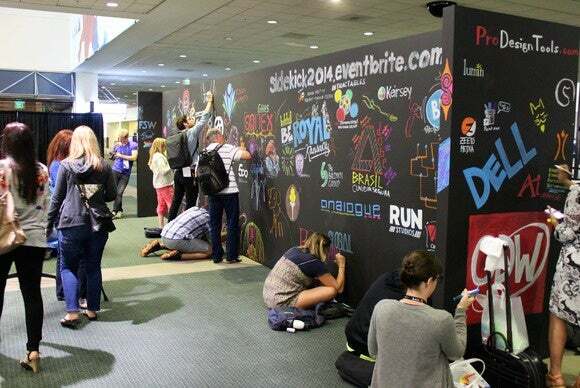 Attendees shared their creativity with others at this large display near the entrance to LACC. One of the first iPad apps out of the gate to take advantage this SDK is FlowVella, a stylish presentation app that runs circles around Apple’s Keynote, especially now that it can pull in images, videos, and PDFs from Creative Cloud—including layers from Photoshop PSD files. “I think this is just the beginning,” Flowboard’s founder and CEO Brent Brookler told Macworld. “We’ve only scratched the surface, and are already planning on adding more features,” such as exporting Flowboard screens as PSD files. “I think it was smart of Adobe to have both their own applications as well as third-party titles to really show the possibilities of the Creative SDK,” he added. Brookler spent a lot of his time at MAX demonstrating Flowboard running on an iPad mini, which he estimates helped “hundreds of new users” discover the app, as well as holding direct discussions with Adobe’s Behance team, putting efforts to get the app’s built-in web player whitelisted at the creative social network on the fast track—and soon, to enable sharing of Flowboard presentations on the service. 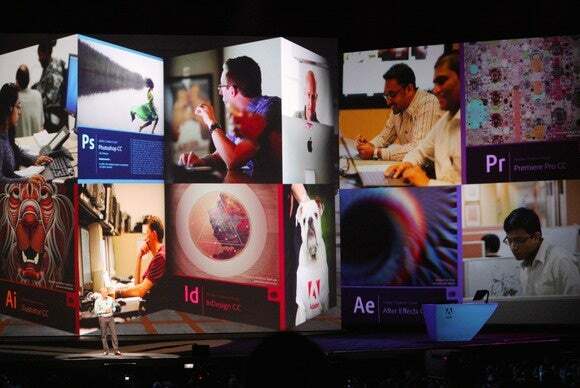 Adobe has announced plans to return to Los Angeles for MAX 2015, scheduled for October 3 through 7. I’ve already marked my calendar.